Just like all of the products stocked by The Fireplace Warehouse, the Dellis Limestone Fireplace with Lights is a hand crafted fireplace made from only the finest quality materials. The Dellis Limestone Fireplace is designed and constructed not only to decorate any home, but also to ensure safety and warmth for those who will use it. At a size of 60 inches, the Dellis Limestone Fireplace is built with a dignified mantle shelf and statured legs for support. This fireplace is made from the quarries of all natural limestone. The white, creamy coloured stone is a rich sedimentary rock that will add style and grace to any room it is in. Additionally, the Dellis Limestone Fireplace comes with lights in order show off the fireplace and to provide proper viewing. 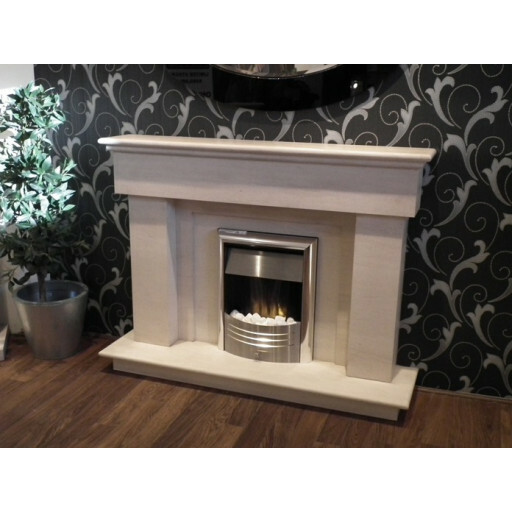 The Dellis Limestone Fireplace is compatible with both gas fires and electric fires. Enjoy this beautiful limestone fireplace in your home for years to come.